Repurposing content can make you incredibly efficient. That’s why I’ve devoted an entire series to the topic here on my podcast. Last week, I talked about my “upstream” method. In particular, I used an example of going from blog to book – starting with the structure of a book as a roadmap, and then writing it little by little while you publish each section in blog form. It’s the best way to get a book project done while you build an audience. I focus more on the second case, since it’s the most common. It’s also all but required in running a sound content strategy. 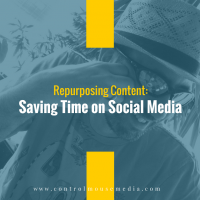 If you’re not repurposing blog content for your social posts, you are missing a huge opportunity to save time and effort. So let’s teach you how to do that. In today’s episode, I cover how to reuse the meta description, the post excerpt, and the post content itself – and to prepare all this content up front so that you can plan for it all to work together in a nice, coordinated way. Listen to the episode here or subscribe in iTunes – and don’t forget to download the templates that accompany this episode! Authors are often concerned that they will get a hard time from publishers or agents if they publish draft book content on their blog. This attitude is beginning to change – so if this is a concern for you, I urge you to check out last week’s episode: Repurposing Content: Going from Blog to Book (My Upstream Method). I have a ton of free templates and tools for you to download, including the Twitter length-checker that I created, and an editorial calendar that I use for social media posts. Join my site as a member and you’ll get free access to all the practitioner content that I create. When reusing the post excerpt for social posts, you really have to pay attention to the context. Here’s an entire episode on this: Repurposing Content Across Different Contexts. If you’re consider whether or not to send your entire blog post in an email newsletter (as opposed to a digest), here’s a lot more detail on the considerations: Repurposing Content Across Different Formats. One more episode in this series: Repurposing Content to Create an Online Course. Subscribe here (and select podcast / every new post) if you’d like to be notified as soon as new episodes are published! Published April 3, 2017 by Michael Boezi.